1. Location-based marketing sounds WAY to complicated and time-consuming for my modest tourism marketing strategy. 2. I don’t think location-based marketing will really get more travelers booking my hotel/tour/etc. The truth is, location-based marketing doesn’t have to be scary and time-consuming. Following just a few key steps can make a dramatic difference in whether or not your tourism business shows up when potential customers are searching for you. Before we dive into the details, it’s important to note that mobile technology has largely impacted the average traveler’s customer journey. This guide from Google clearly illustrates the importance of mobile search in the travel industry; perhaps what is most enlightening in this case is the fact that a staggering 85% of leisure travelers only decide on activities AFTER they have arrived at their destination. 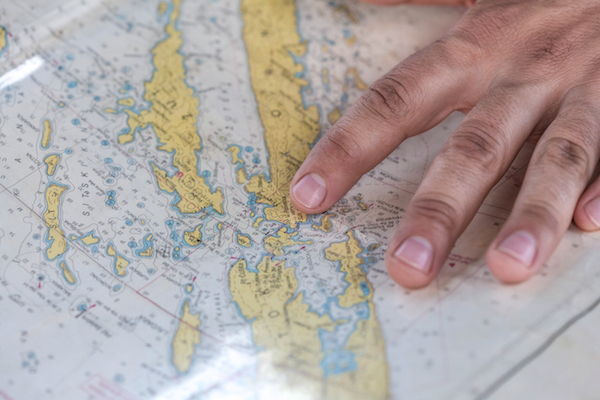 In its essence, location-based marketing is all about using location data in order to connect with customers in close proximity AND foster loyalty + engagement through more personalized marketing messages. Communicate with the right people, at the right time, with the right message by strategically utilizing the massive amount of location data that’s available. You already know that the vast majority of travelers are turning to search engines to find the best local businesses in their area—and this also applies to travelers making last-minute trip planning decisions. Of course, you want your business to show up when people are searching for you! So what can your business do today to optimize for local search? According to some stats, the Local 3 Pack shows up in the top section of Google results for some 93% of local searches (after paid ads.) By optimizing your Google My Business page, you’ll better your chances of showing up in these three optimal positions. What’s more, you’ll be delivering value to potential customers by immediately sharing key information such as your business’ address, phone number, location, Google reviews, hours of operation, and more. With over 60% of people searching the web from their mobile device, your tourism business absolutely must have a top-notch mobile website design if you’re going to show up in search results + provide a five-star user experience for customers. In fact, Google recently released an update to their algorithm that prioritizes content optimized for mobile above all else. In other words, Google will rank its search listings based on the mobile version of content—even if the person is searching from a desktop computer. We’ve written an entire post about the 3 Crucial Mobile Website Design Tips Your Tourism Marketing Strategy Needs. We highly recommend reading it if you’re not sure if your mobile website is up to par. 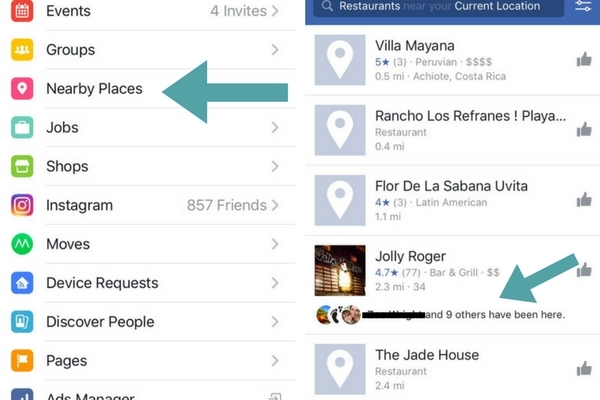 Just as you can search Google for businesses near you, users can also use Facebook + TripAdvisor to discover “Nearby Places”. Note: These tips will also ensure your business is prepared for Facebook City Guides. For more information on City Guides as well as additional detail on the above points, read our in-depth article here. 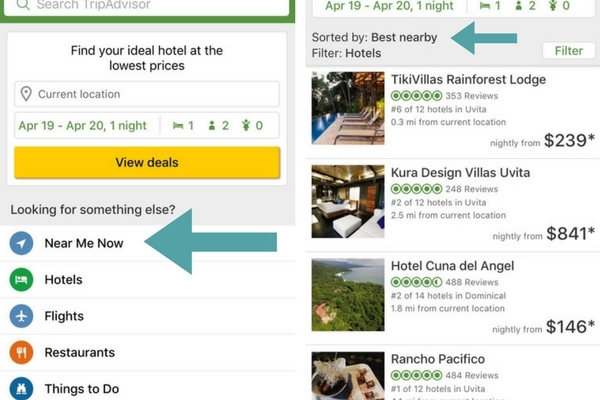 Similarly, TripAdvisor has a “near me now” function that lets users search for businesses in their location. The steps for ensuring your tourism business shows up (and encourages customers to click-through) are largely similar. Geo-tags allow you to listen + engage with highly-targeted potential + past guests in order to optimize your marketing message and ROI. 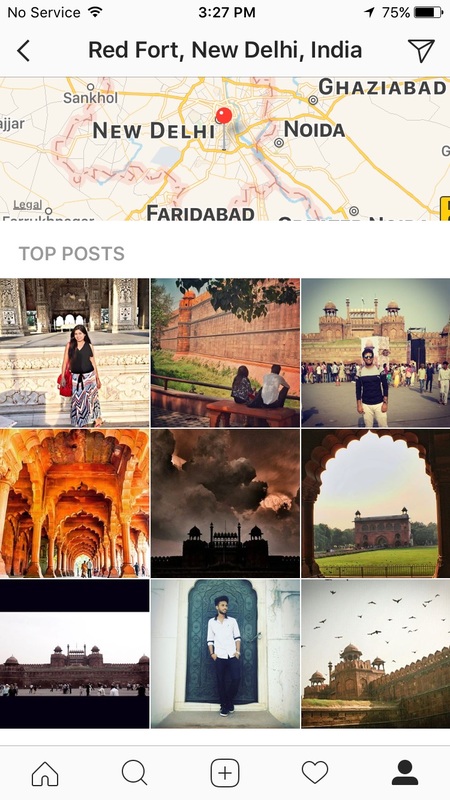 We recommend engaging with those users who are posting photos near you. For example, when someone tags a photo at your regional airport, leave a comment with your top suggestions on what to do while in town. Provide unexpected value, and people will want to check out who you are and what you offer. It’s also absolutely critical that you tag each and every one of your photos with the correct geo-location. This is a great way for travelers to find your business, whether they’re looking for inspiration for their next destination or already in the planning and booking process! Additionally, taking advantage of User-Generated Content is a smart extension of location-based marketing. You can monitor your brand’s location tags, and share those photos + status updates that capture a unique perspective or inside look at your offering. Or, try developing a fun and creative campaign that encourages your customers to upload their own photos to social media with geo-tags. For more inspiration, don’t miss our complete guide to User-Generated Content For Tourism Marketing. If you have a paid-advertising budget, then we highly recommend brainstorming creative ways to incorporate location-based advertising into your strategy. The power in location-based advertising is that it lets you customize your advertising message based on where your target customers are located. With so many ads bombarding us everyday, the power of personalization quickly becomes clear. For example, let’s say you’re a tourism business in Austin, Texas. You’re keeping an eye on the latest news and learn that a new direct flight route is opening up from Raleigh, North Carolina. You could then create a set of ads targeting a specific demographic in Raleigh with a personalized message, depending on who your ideal customer is. This is just a simple example. For additional creative campaign ideas, this article has some interesting case studies of location-based advertising in action. But for now, we don’t want to get too far into details as we believe it is more important to focus on your mobile website, content, social media channels, and other online marketing pillars before spending money on ads. That said, it is crucial to have location-based advertising on your radar, especially once you have covered your other bases and are ready to take your tourism marketing to the next level. Are You Making This Common Tourism Marketing Mistake?